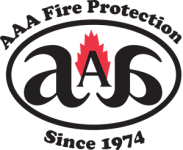 Fairfield businesses and businesses throughout the North Bay know that they can rely on AAA Fire Protection Services to help maximize fire suppression and reduce the risk of fire. As a family-owned business, we spent the past 40 years, helping customers just like yours decrease the risk of fire by supplying affordable and comprehensive fire protection services. Those services include complete fire sprinkler services, including fire sprinkler installation. As experts in fire suppression, we understand that your business is unique. That's why we work with your design team or architect to determine the specific needs of your business. By understanding your building and your business we’re able to design a fire sprinkler system that offers the best fire suppression capabilities. In turn, that helps to decrease the risk of fire to your business. In addition to fire sprinkler installation, we perform fire sprinklers inspections as required by fire code. When we find deficient fire sprinkler systems, we offer fire sprinkler repairs which help to bring your system back up to its full fire suppression capabilities. To learn more about how we can help you reduce the risk of fire, just give us a call at (800) 543-5556.